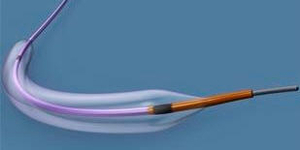 TransFormOcclusion Balloon CatheterThe TransForm Occlusion Balloon Catheter is a single-lumen occlusion balloon for use with endovascular coil embolization. A balloon catheter has an inflatable balloon at its tip. The catheter is inserted with the balloon deflated. The balloon is then inflated so the procedure can be carried out. It is then deflated to allow withdrawal. These devices are used during procedures involving the cardiovascular, bladder, biliary, urethral and other systems. The most common types are cardiovascular catheters employed for angioplasty, blood vessel dilation, temporary occlusion of blood flow or similar purposes. Drainage and dilation constitute the majority of other uses. Most catheters are single-lumen models, with only one tube. Double-lumen versions have two tubes, one within the other, permitting two distinct operations.